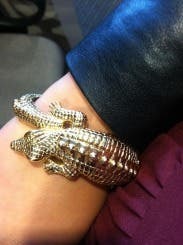 Have an arm party with this fun Kenneth Jay Lane gator cuff. 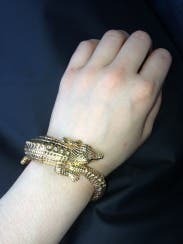 18 karat gold plated stretch bracelet with alligator detailed design. 6" circumference. I rented this for my Birthday and got so many compliments!! I love it and would rent it again/buy! Perfect accessory for a fun or fancy affair! You can't totally tell from the picture, but it is AMAZING! I was so looking forward to wearing bracelet, but it was broken when it arrived. I contacted RTR and they promptly issued a refund. I love this bracelet! It added such a funky feel to my dressed-up look! This bracelet got so many compliments! I didn't expect it to be elastic, and when it's on it doesn't look like that's how it's put together, which I liked a lot. It added a lot of whimsy and fun to my outfit. Love it. I like this bangle as it adds an interesting element without being too flashy. It is the perfect add-on to any outfit. 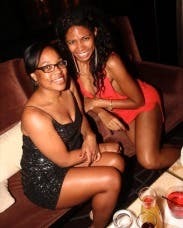 I paired with a coral dress. I felt chic to death. I expected the bangle to have a C-ring clasp, but it was on an elastic band. I absolutely loved the look , and it was not clunky as with other bangles. Fun Bracelet for a fun night! Easy fit, and great to pair with other bracelet/jewelry. Very Fun! Loved this bracelet. It made my outfit very unique and I got compliments on it throughout the night! Felt sturdy even though it was stretchy. Fun addition to my RTR dress! I wore this with the Trina Turk "Key to Success" Dress, and it was the perfect accent piece. Really did not want to send this back! It's elastic, which somehow I wasn't expecting (probably didn't read the description), but I seriously love it and I really wish I had just bought it instead of renting it. It is awesome. Rented this for my bachelorette/birthday weekend in Vegas. It's a great piece- very comfortable, not too heavy, and a nice addition to my outfit! This bracelet is SO adorable! I would buy this in a heartbeat if DH would allow it! 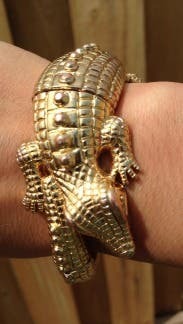 I think the alligator is adorable curled around your wrist, and it even has a little zig-zag etching for teeth! People kept asking to see the bracelet trying to figure out how it got put on - no one had any idea it was elastic until I showed them! I wore this all day for 3 days, I loved it so much. Easy fit - it expands to fit over your wrist - and is heavy but not overly so. 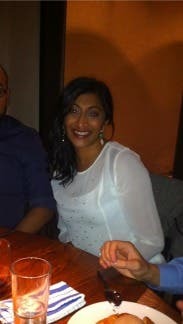 Got lots of compliments! This bracelet was fun for a night but it felt very light and slightly cheap. This bracelet fit perfectly, and added a nice edge to my girly maroon dress and black, cropped leather jacket. It shone beautifully against the matte fabric of my dress! Would definitely rent again. Subtle and classy at the same time - got a lot of attention but wasn't "in your face"
Looks better online to be honest it's a nice bracelet but I could've probably found something nicer at forever21. Great rock 'n' roll touch. I wore this bracelet with the Nha Khanh Karla Dress and the Love Potion Moschino clutch. 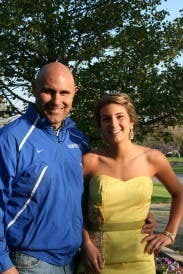 It was a perfect bold accessory to edge up the sweet dress and tie in the clutch. I had women complimenting me on the bracelet all night. Other users have complained that it is segments connected with elastic. That is how it is constructed (it is not two solid halves on a hinge) but the pieces connected together seamlessly and it wore like a solid bracelet with the ease of elastic. It had a great weight and didn't look plastic-y or cheap. It really was a great accessory and the pictures online portray it accurately. 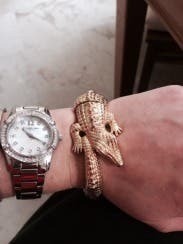 Stretchy, fun gold bracelet. Great accessory for wedding. 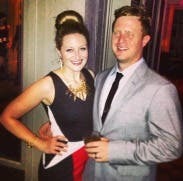 Loved wearing this to a charity benefit! Super cute, loved it, wish I owned it. It was a little big for me, I have tiny tiny wrists, but worked well! There was some wearing on it where you could see a little bit of the coppery color underneath the gold, but you could only see it in bright light if you looked really close. I loved wearing this bracelet. It is not a cuff with a hinge like I expected...it has rubber strings running through channels on the inside. 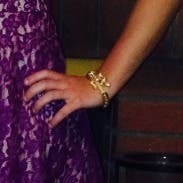 I wore this bracelet with the "in the limelight dress" by Badgley Mischka along with Slate and Willow earrings. Everything went together perfectly and I received a lot of compliments on the bracelet. I will definitely rent it again! I am not a fan of the University of Florida (Go Dawgs), but to support my boyfriend when he graduated with his Masters from UF I thought I would add a little UF bling to my bracelet stack. I loved this piece, great by itself or with a stack of other jewels! A little heavy but worth it. I'm going to go buy this bracelet! It was so cute and fun to wear. I'm obsessed with this bracelet! This piece adds so much fun to an outfit. Super fun bangle, fierce and fun! Loved this. Really dramatic. It does have an adjustable elastic like connection so it can fit on anyone, but it was done really well and the seam never showed. It didn't pinch either, which is always a plus. It was a bit flimsy, and I worried about it coming off constantly. But it a good quality and very cool looking. This bracelet is formed from four pieces with elastic strung through them, so you stretch it apart to put it on. That made the bracelet feel less fancy. Otherwise, the alligator design is very fun! Worn with the Halston Heritage Crave You Maxi and Suzanna Dai Hanging Garden Earrings to a formal fundraising gala. The event was "safari-themed", so it was a fun addition. As others have noted, it's several pieces on elastic, which made it comfortable. such a cool piece. the bracelet is four pieces strung together, stretches on. i have smaller wrists and it still fit great. nice weight too. loved it, a little something different to add to my look. Beautiful accessory for many dresses! I LOVED wearing this accessory! I have actually rented it twice because I received so many compliments the first time around. You can pair it with almost anything and everything. Gives and edgy accent to any dress! This cuff is adorable! It ended up being too big though, so I couldn't wear it. It kept sliding around my wrist. 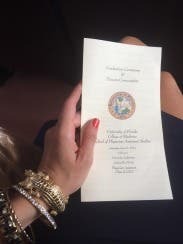 Wore this with the Parker Clarence Dress for a Florida wedding. The bracelet stretches with elastic bands to slide onto the arm. I really liked it- added some unique character to the outfit. I wore this to a work related awards banquet with approximately 500 people in attendance. I put that this is true to size in terms of fit but I think it was a bit smaller than expected in terms of the size of the piece itself. I think it was and inch and a half wide? I thought it would be closer to two/ two and a half inches wide. Nonetheless it fit well and looked good. And people complimented it. This was a great bracelet. It's on an elastic so it's very easy to get on and off. It matched my dress perfectly.